Even the U.S. and Canadian federal governments have finally read the memo: we're in a recession. Of course, those of us that actually work for a living knew this some time ago. But, seeing as we don't fly around in corporate jets or attend cocktail gatherings on a daily basis, how were we supposed to get some face time with our elected representatives to deliver the message? However, now that they have likely seen their retirement savings statements going negative as well, they're at least prepared to pretend they are listening for the next little while. Don't waste your time giving them your opinion. It's clear from the TARP plan (save the greedy bankers - [2009.02.14 - here's an interesting commentary: [link http://www.edmontonjournal.com/Business/Business/1285498/story.html" has bit-rotted]There are fortunes to be made in screwing up a bank), the 2009 Canadian federal budget (tax cuts now, stimulus to create jobs later, maybe) and the Obama stimulus package (save the bankers' friends and hope they'll stop off-shoring the jobs), who has the ear of federal legislators. It's time to learn from our federal representatives. They have looked after themselves and their friends. We need to do the same. Save money, not bankers! For several years, I have presented tips on how to reduce your energy costs and save money. This could have been a great source of revenue, except that I gave the information away for FREE! So far, I still do. So, before I change my mind, go read the relevant pages on the Econogics Web site. I even wrote a few columns for weekly newspapers called the Miser's Guide to a Better Planet. Sadly, those were never picked up, but you can read them here, FREE! And now, here are some more frugality tips. You guessed it, FREE! Join your local free-cycle or equivalent network. The idea is that you offer up items you no longer need to your neighbours for FREE! via e-mail lists, and they do the same. (Yes, you can get FREE! stuff!) Start at freecycle.org. Save useful items from going to landfill and save money. Shop for second-hand items. You can find these at garage sales, consignment shops, pawn shops, via Internet sites, in the newspaper classified ads, community bargain-finder publications and more, even on-line retailers. For example, Amazon.ca has links to second-hand book outlets for many titles. 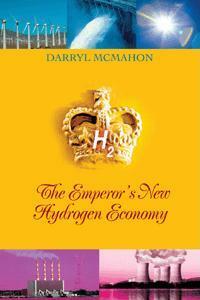 (Yes, it’s OK if you buy my book, The Emperor’s New Hydrogen Economy, second-hand.) Don't forget your local thrift stores like Goodwill and the Salvation Army. I furnished most of an apartment from the Salvation Army store recently, saving a lot of money. Buy some yard-tools as community property items. Things like lawn-rollers, possibly wheel-barrows, etc. are relatively expensive, take up storage space, and are not used frequently. Why not split the cost with neighbours and share the savings? Menu planning. Eating out is an expense where we can cut back and save money with a little thought and planning. Start with the local flyers and look for this week’s bargains. Then figure out the meals you need to prepare for the week. Then come up with recipes that make use of the current bargains, and remember to make enough servings to have left-overs for subsequent meals and ‘brown-bag’ lunches. Don’t forget the potential for trailing meals, e.g., a roast beef dinner can spawn sandwiches, stew and soup. Once you have the menu plan for the week, then it’s time to go shopping. Don’t forget about balanced meals covering the basic food groups when doing your planning, and try for some variety to keep things interesting. Contingency plan meals. Some days, things just don’t go according to plan. To avoid the cost of a meal out because the schedule fell victim to the unexpected, have a meal based on non-perishables (notably canned and frozen foods) in reserve that can be prepared and served quickly. When planning a budget, don’t forget to include allocations for savings, treats, and charity. If you actually read this far, and you thought this was helpful and would like to see more frugal tips, let me know, and I will spend some time coming up with more to share - yup, FREE! 2009.02.02 - Have you earned points in a frequent buyers program like Air Miles, Aeroplan, Sobeys, Hudson's Bay Company, etc. that are just sitting because you were saving for the BIG reward? But now, it seems further away than ever as you are trying to make ends meet? Well, take a look into the small rewards that are available in those programs. They often include movie gift certificates, gift cards for restaurants, book stores, music/video stores, coupons towards groceries and more. So, consider cashing in some of those points that are just collecting dust and using those rewards to get groceries, movies, a dinner out or other small luxuries that can help make frugal times a bit more bearable. 2009.02.03 - Get your debt under control! Make a plan to do that! If you have a computer with either Excel or OpenOffice, check out this Debt Reduction Calculator. It's FREE! It comes as a zip file, including both the Excel and OpenOffice versions (for either 10 or 20 balances each). I have used the OpenOffice version, and it is a real eye-opener to see the difference in the money in your pocket if you target your higher interest rate debts first, instead of those with the lowest balances (apparently what most people do). If you are in Canada, and looking for impartial advice for dealing with debt, from a non-profit organization, contact the Credit Counselling Society. The first Christmas after our daughter Jessica was born, we spent the holiday with my parents. After dinner, Mom and Dad sat next to each other on the sofa, taking turns cuddling their first grandchild. Jessica began to whimper softly, and Susan took her from Dad's arms. 'She probably needs to be changed,' she said, carrying the baby into my parents' bedroom to diaper her. When Susan came back into the living room, there was a strange mist in her eyes. 2009.02.21 (I finally received a request for another item.) Suppose you have filled the pickle jar (or have managed to scrape up some savings), how do you get those to grow, even for short periods of time, without risking it in volatile times in the financial markets? One new option for Canadians is the TFSA (Tax Free Savings Account). The TFSA allows you to put your money (presumably already taxed) into a safe harbour where any gains (e.g., interest) can accrue without being taxable. Unlike an RRSP, when you take money out of a TFSA, there are no taxes to pay. With a $5,000 annual contribution limit, this is not for big investors, it's for folks like us where saving $5,000 in a year will take effort, not just a signature. Right now, Canadian banks are offering deals to get you to open your TFSA with them, as it is a new product category. Things to watch for: make sure the account is covered by the CDIC (Canadian Deposit Insurance Corporation); that there are no withdrawal or deposit or other odd service fees; and, that you get the best rate possible. Here's a page that discusses interest rates from on-line banks in Canada. Here's another on high-rate savings accounts. 2009.02.22 - Cellular Telephone Costs - Love your cell phone, but hate the bill that comes with it? Here are some things you can do about it. Shop around for a contract that fits your habits. If you are an incessant user, get a package with lots of air-time. Do a lot of long-distance? There are packages for that, some of which are tailored to when you do your calling, whether for business during prime-time or social on evenings and weekends. Is most of your long-distance to a limited number of people? If so, there are favourite-5 and favourite-10 packages available. In any case, before doing anything dramatic, call your current carrier, and see if they have any recommendations for getting your costs down. If texting is your downfall, there may be a package to help out with that, or as with all billable usage, find ways to cut back. When your contract is coming to an end, do some shopping around and see what makes the most sense for you financially. If your phone is adequate to your needs, working well, and you are happy with it, you may be able to switch to a monthly service-only contract. This should be cheaper, because most multi-year contracts are priced to include the cost of the cell-phone, which is usually bundled into the deal for free or a low cost. 2009.02.23 - Greening Your Mortgage - If it's time to renegotiate your mortgage (and with interest rates lower than they have been in for decades this might be a good idea even if your mortgage isn't due for renewal), consider going with a 'green' mortgage. Surprise! It can be less expensive than the regular run-of-the-mill mortgage, and it's going to help you save on energy bills in the future. In the U.S., look for institutions that lend under the Energy Star mortgage program. In Canada, check out the major banks. For example, TD Canada Trust offers a green mortgage with a rate a full 1% below the standard rate, plus a rebate on eligible appliance purchases. 2009.03.11 - Cities on the Cheap - frugal chic is in! Even the blogosphere is taking note! If you have stashed a few bucks and need to get away from the local gloom, Cities on the Cheap has just launched their Web site with ways to stretch your dollars while traveling to cities in Canada and the U.S. If you have time, but money is scarce, give the gift of time this year. IOUs for specific tasks are often welcome gifts, such as a season of clearing the driveway, mowing the lawn, washing the car, helping with spring cleaning, washing windows, etc. Instead of buying prepared foods for entertaining, look up recipes, buy the ingredients, and make them yourself. Home-baked Christmas treats make good gifts (though fruit cakes are expensive to make yourself and not always the most welcome of gifts). If you know the recipient is on a sugar-restricted diet, prepare the sweets with Splenda or stevia, and mark them as such. Sure to be appreciated. Instead of fancy gift tags, cut a piece from the same wrapping paper, fold like a card, write on the blank side, and tape to the package. It appears the recession is not really lifting after all. More Canadians and Americans are unemployed, and the markets are finally getting the message and shedding their exuberance, too. Now that it's winter, many of us are dealing with heating bills, along with all the other expenses of daily life. Here's a new site with daily tips on how to reduce your energy expenses, while also reducing your greenhouse gas emissions (climate change). For the past few days the tips have been about reducing household heating costs. Even though many of us are working to cut our expenses, there are simply some things we cannot put off buying. Rather than climbing into our car, burning our gasoline, more and more people are shopping on-line via their computers. However, given you are still in a frugal mood, and trying to stretch those dollars, don't be afraid to shop around, and look for on-line coupons that may relate to a purchase you need to make. While searching for something else, I came across this frugality blog. I hope you enjoy it as much as I did. Just when I thought there was a chance we might be seeing some real economic recovery, in spite of our governments, Japan suffers the trifecta: powerful earthquake, a massive tsunami, and a nuclear incident. Japan was already an economic basket case, and the world's 3rd largest economy. The economic ripple effects will shake the world economy. Number 1 automaker. Major electronics companies. In short, if you are not affected directly by these tragic events, brace yourself for economic tremors that will affect you. A renewed/continuing recession is probable. For most of us, income tax time is coming. You may be looking forward to a refund cheque, or dreading having to come up with funds to pay what you owe. Either way, having a financial plan and knowing your resources can come in handy. Taxes are a big part of what most of us pay as part of our daily life. Understanding them and acting to reduce them can pay big dividends. Managing your finances successfully requires understanding all the resources at your disposal, especially in the trying times of the recession that never seems to end. One such resource for those with a steady income is the pay day loan. While it probably should not be a tool you use regularly, it may have a valid place in your financial tool box. Getting an income tax refund? How are you going to spend it, or is it already gone? If you have outstanding credit card debt, paying that down is probably a good way to use that money. Suppose you are getting a $1,000 refund, and have that much or more as a credit card balance at 1.5% interest per month. Pay down that balance with the $1,000, and that becomes $15 a month in your pocket in saved interest costs - forever! That's not just $180 a year, but due to the joys of monthly compounding by the credit card company, it's actually $195.62. And if your card charges more (some have a nominal annual rate of 24 to 28%), that amount will be even more. One of the sad realities of the current recession that never quite seems to end is the financial toll it is taking on many families and individuals, even forcing some into personal bankruptcy. For some, it seems the only way out. When considering bankruptcy, consulting with experienced financial professionals can provide peace of mind. If it comes to that, get some expert advice before committing, and don't face this process alone. After years of anticipation, our home has finally been moved to interval pricing for our electricity. This is also known as Time-of-Use (TOU) pricing. In short, our electricity generator utilities are generally designed to produce a constant amount of electricity, around the clock, using large, expensive generating stations. These may be powered by coal, nuclear, hydro, natural gas or other fuels. The thing they generally have in common is that the fuel is cheap compared to the plant structure and infrastructure, and they are designed to operate continously, regardless of weather or time of day. However, the demand for electricity is anything but constant. As residential consumers, most households have a small peak in the morning as we make coffee and toast, and flip on the radio or computer to get the traffic report. Then, we largely abandon our houses to go to school, or work, or run errands or volunteer, and the electricity demand in the house drops. There may be a small increase around lunch time for those of us who stay at home (to work or for other reasons), and then demand drops again for much of the afternoon. One exception for the afternoon drop is on hot summer days when air conditioners may be working harder to overcome the daytime heating effects. The next demand peak comes as people return home, and start cooking dinner. TVs, stereos, computers are turned on, as are stoves and microwave ovens. Air conditioners may be cranked up. Other appliances and power loads may be turned on. The result is a significant surge in demand for electricity, which comes from a supply that is not really designed to handle fluctuations economically. That means it costs the utility more to supply a kilowatt-hour of electricity at peak demand times than at low demand times. Time of Use pricing is about passing along some of that price signal to consumers. Locally, there has been much wailing and complaining about the change from constant pricing to time-of-use pricing. That's because most people don't understand the opportunity here to save money. As you are reading my frugality page, you are clearly not most people. You see, time of use pricing really means that your electricity supplier is putting electricity on sale at reduced prices every day. In my area, they have established the time from 7 p.m. (just after the dinnertime demand surge) to 7 a.m. (just before the breakfast time demand surge) as half-price time (well, almost - 5.9 vs 10.7 cents per kilowatt-hour is tecnically just a 45% saving). (Pricing shown is the wholesale price for the electricity - your effective rate will be higher due to other charges and taxes tacked onto that based rate.) Also, every weekend day and statutory holiday is sale-priced electricity time. There is also a mid-peak time each day, where electricity is priced at 8.9 cents per kilowatt-hour. Seriously, who else is offering you a 45%-off sale every day?! On something you really need and use. Every DAY a new savings opportunity! In many cases, no cost to you to play. And in Ontario, consumers are complaining about this deal. In my situation, of the 168 hours in a week, electricity is at the cheapest price at least 108 hours, or over 64% of the time. For an addtional 30 hours a week, it is at the mid-peak price - about 18% of the time. Finally, it is at the highest price less than 18% of the time. If you can shift your electrical use away from the 30 hours a week (or less) when it is priced the highest to other times, you can save money. If you can't or won't shift away from those times, well, that's why they are the peak demand times, and are priced the highest. If you want to win in the stock market as an investor, the key is to buy low and sell high. As a consumer, you want to buy low. Why would you want to pay extra for something that obtains no benefit. It's not like a kilowatt-hour of electricity you buy at 5 p.m. is better or cleaner than the one you buy 2 hours later at 7 p.m. In fact, the opposite is likely true. Not only is the 7 p.m. kilowatt-hour cheaper, it's probably produced from a cleaner, cheaper fuel source. Load shifting is the practice of changing when you use electricity so you can save money. How can you load shift effectively in your home? One example I like to point out is cleaning dishes. Suppose your family finishes dinner around 6:00 p.m. You can load up the dishwasher, sink or dishtub as usual. However, if you start the dishwasher before 7:00 p.m. when winter rates are in effect in Ontario, the price of the electricity is $0.107 per kWh. If you wait until after 7:00 p.m., the price drops to $0.059 - 45% less. Many dishwashers made in the past decade even have a start-delay function built into them. So, you can load the dishwasher per usual, select the start-delay function and forget about it, going about your other business. The timer will look after turning on the dishwasher later, when electricity prices are lower. No extra cost to you, and you get to save money every day. If you do dishes by hand, and your water is heated electrically, you can also save by doing the dishes later. Let them soak in the sink or dishtub in cold water when dinner is over, but put off washing with the electrically-heated hot water until the cheap electricity rates come into effect. What other electrical loads do you have in your house that you can easily shift from high-price times to low-price times? Do you have a PVR or other time-shifting capability for your favourite television programs so you can watch them during off-peak pricing periods instead of peak-pricing periods? Big plasma TVs can consume a fair bit of electricity. One of my peak-hours electricity consumers is my coffee maker. I work at home, and I generally brew a pot of coffee in the morning at breakfast time, and take the last cup from it around mid-morning. Many afternoons, if I am working from home, I will make another pot of coffee or tea. I already have the coffee maker on an isolation switch, because it consumes 7 watts continuously just to power its "I'm alive" light and clock display - for which I have no use. When I turn the coffee maker on, so the heating element for the water and the warming plate come on, the power consumption jumps instantaneously to over 900 watts, and then settles down to 860 watts during the brewing process. Finally, once the brewing is complete, the warming plate remains active for up to 2 hours keeping the brewed coffee warm in the glass pot - and glass is a poor heat conductor. The heating element cycles on and off during the keep-warm period. I'm using a power consumption meter to establish how much power it actually takes to make 3 mugs worth of coffee (0.09 kWh) and keep it warm (0.13 kWh) for a total power use of 0.22 kWh for the full cycle. (The power use information comes from a power monitor device I have. No self-respecting energy geek should be without one (or three or five). For certain occasions, I have a 'coffee butler' - a thermos designed to hold brewed coffee. Starting today, once the coffee is brewed, I will be pouring the contents of the brew pot into the butler thermos, and turning off the coffee maker. This has the added advantage of bringing the hot drink to where I am, instead of me having to go back to the kitchen for refills, less of an interruption to my day. I expect to save about 0.26 kWh per weekday this way during on-peak hours - about $10 a year this way. (If you aren't interested in saving $10 in after tax money for zero or minimal effort, you probably aren't a real frugalist). Continuing with my efforts to move my electrical consumption to off-peak times from on-peak times, there are my 2 chest freezers. The chest freezers have a great frugal story of their own. I got both of them for free, in return for helping friends or relatives move, and the freezers were surplus to their new abodes. So, they ended up in our basement, where they allow us to stock up on food items when on sale, and store them relatively inexpensively until we are ready to use them. Each freezer uses a bit more than a half a kWh per day per past measurements. This is considerably less than their rated power consumption. There are a few reasons for that. First, they are in a cool basement, so the temperature difference between the inside and outside of the freezers is less than would be the case if they were on the main floor or in the kitchen. Second, they both sit on slabs of extruded polystyrene insulation board, which reduces their energy consumption by about another 25% relative to sitting directly on the floor. Third, when the amount of food we are storing can fit in one freezer, we unplug the other so it is using no power at all. When the big sale comes along that justifies stocking up, we just plug in the second freezer again and load it up. That's good stuff for saving energy and money in general terms, but right now I'm focusing on load shifting. How can I get my freezers to use less electricity at peak-price periods, and more at low-price periods? How about an appliance timer? I know my freezers will keep goods well below freezing for more than 24 hours without power, because my power company has conducted that particular experiment for me in the past. Let's look at the math. I don't expect to reduce the power consumption via the timers, just shift it from peak demand to off-peak periods. The difference is about 4 cents a kWh. Assuming a freezer uses about 600 Wh per day, and 70% of that would normally be consumed in the warmer part of the day, which coincides with peak and mid-peak demand times, what are the savings? 420 Wh per day, at 4 cents a kWh is about 2 cents per day. Over the course of a year, that's $7.00. I spent just under $20 for the appliance timers (highly programmable with easily accessed bypass controls and battery backup, a bit overkill for this application), so the payback will be in the order of 3 years, or roughly 35% annual return on investment. That's considerably better than my retirement savings are doing these days. MyHydroLink. 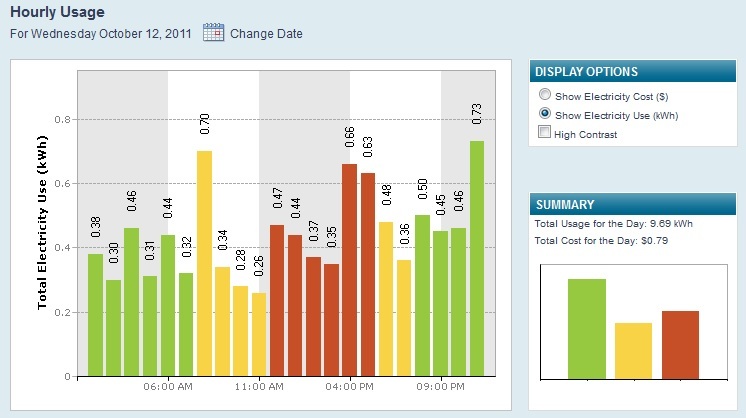 One of the good things to come from the installation of Smart Meters is the ability to get better and more timely information than we get on our monthly or bi-monthly bills. It's a lot easier to connect energy consumption presented by the hour as it occurred yesterday, than when you just get a big aggregated number that is your total use for 2 months, which ended 2 or 3 weeks earlier. The image above shows my household power consumption for one day, by hour. The colour coding shows the rate periods for the power consumption. Here are some things I can see from the diagram. Our total power consumption for the day was under 10 kWh - not bad. The house seems to have a base power consumption rate of about 250 watts. That is likely used by things like clocks, freezers, the refrigerator and phantom loads like the cable TV set top box and VCR (which lose their minds when the power to them is interruped, a couple of small battery chargers, and the task lighting in my work area. The peak from 7 to 8 a.m. corresponds to making breakfast, while the peak at 3 to 5 p.m. corresponds to making dinner. The final peak from 10 to 11 p.m. is about starting the clothes dryer. It looks like I could save a few cents by making breakfast just before 7 a.m. instead of just after. Hmmm, is it worth getting up a few minutes earlier, or changing my wake-up schedule (breakfast then shower instead of shower then breakfast) to save a few cents most days? I'll have to think about that, but the point is that this hourly power consumption information means I have the information to base the decision on, where before I had no idea where my power usage occurred through the day. That sort of information can save you money. If your electricity provider can supply this kind of information to you, sign up to get it, and look it over. You have nothing to lose, and it might save you some money. This link came to my in-box today. With a title like Save money every day: Ten painless tricks, how could I possibly resist? Anyway, I thought there was enough good stuff in here that it was worth sharing. Enjoy! Want more? Just ask! Got more? Send them along.